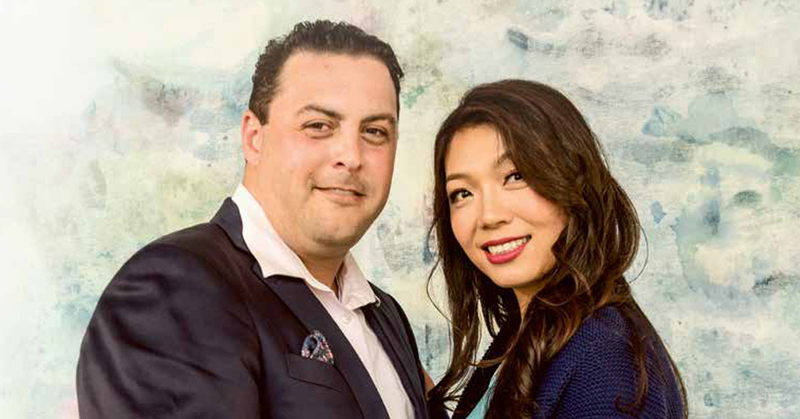 The Chinese-born soprano Sharon Zhai and the Western Sydney-born tenor Matt Reardon are meeting each other for the first time. This interview and photoshoot is something of an icebreaker. 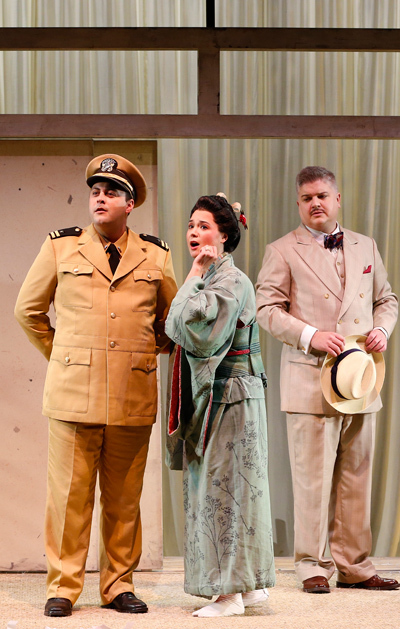 It is still several weeks before Sharon Zhai and Matt Reardon are scheduled to enter the rehearsal room to play Japanese geisha Cio-Cio San and her beloved United States American naval officer B.F. Pinkerton in a new Opera Australia touring production of Puccini’s Madame Butterfly. Any encounter prior to acting out this most desperate of operatic love affairs can only be helpful. Zhai was born in Henan province in Central China’s Yellow River Valley and graduated in opera performance from the Central Conservatory of Music in Beijing. She obtained her masters in music from the Sydney Conservatorium and in 2008 gained a distinguished talent visa from the Australian Government. She then spent eight years perfecting her voice in Milan, Italy where, incidentally, Madame Butterfly was first performed, in 1904. Reardon, raised and still living in Bankstown after completing his Masters of Opera at the Wales International Academy of Voice in Cardiff, is asked by the photographer to wrap his arms around Zhai’s midriff. “Is your husband Italian?” asks Reardon. Based once more in Sydney with her husband and eight-year-old son, it’s a good thing Zhai is fluent in three languages. Having assumed she would be singing the role of tragic Cio-Cio-San in Italian, Zhai only recently learned the show would be sung entirely in English for this tour, a creative decision designed to attract audiences less familiar with opera performed in European languages. 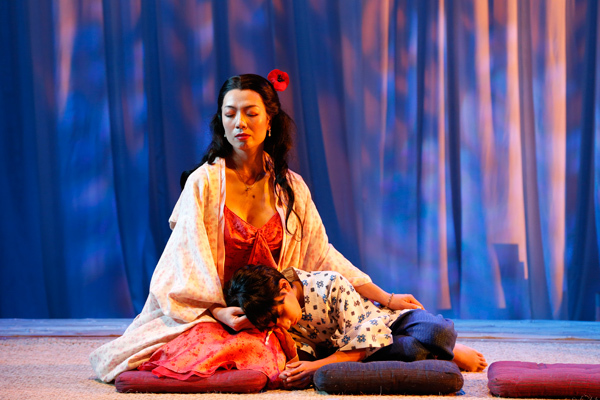 For Reardon, performing at Riverside Theatres in this John Bell-directed production of Madame Butterfly will be something of a homecoming. As a youngster he saw many shows at Riverside and based his HSC theatre lighting study project on the theatre’s rig. Many of Reardon’s local family and friends will be packing the Riverside to see him sing the cad Pinkerton. So, how do two performers who don’t know each other find the necessary chemistry? Does a sense of humour help build rapport? “You answer first,” says Zhai. “I think the stereotype of a tenor and a soprano is that they have large egos,” says Reardon. The pair laughs knowingly, already beginning to finish one another’s sentences. Zhai sees lovelorn Cio-Cio-San, who waits in vain for years for her lover Pinkerton to return across the seas to her, as more than simply tragic. Zhai says she relates to Cio-Cio-San’s story in two ways: absences from her own husband while touring, and the love for the child they share. Does Reardon see Pinkerton as more than a cad? Can he empathise with anything the naval officer does? Both agree that the life of an opera singer on the road is challenging. “How are we travelling?” Zhai asks Reardon. “In a bus, I think,” he says. The tenor and soprano express gratitude that they’ve been able to meet one another and have a laugh well ahead of the hard work of rehearsal. At the end of this meeting, they exchange phone numbers, with Zhai asking Reardon if he’d also care to connect on social media. The ice is broken. This could be the start of something beautiful. Written by Steve Dow and originally published on Audrey Journal. Production images by Jeff Busby. Main image by Steven Siewert.